Posted on November 23, 2014 by Ronald Patrick Raab, C.S.C. Today we celebrate Our Lord Jesus Christ, King of the Universe. This is the last Sunday of our liturgical year. This celebration is a reminder that all things are in Christ. This image of king is not about our earthly understanding of all power and authority; it is about knowing that in time, all things belong to Christ, that in the end, everything will be all right. This is an amazing image for us to consider. “All things”, that means poverty, loss failure, sinfulness and greed. This means our personal sin and corporate irresponsibility. In other words, Christ will take on to himself the world as the world is, all things will find a home in Christ who is the King of the Universe. The gospel today, Matthew 25:31-46 is particularly powerful. I believe this is one of the most important texts in the four gospels. Imagine this, we will find salvation only if we visit a prisoner or offer someone a glass of water or share a meal or clothe the naked. When we visit the sick and befriend the marginalized then we shall enter the house of the Lord, we shall find salvation itself. This seems so easy. Yet, we gloss over this passage as a Church because it is difficult to live on a daily basis. There are days when it is easier to find a rule in a book and follow it rather than be associated with people on the margins of society, or who are sick or contaminated or who find their home is behind bars. We fear the losses of other people. This is why this gospel is so difficult to live. We fear losing our homes, our financial security and even our freedom. This is why sheltering the homeless, offering people security and visiting people behind bars is so difficult, because we tend to have the inner instinct of fear that it will happen to us. However, we are called into such countercultural activities because people need us and we need to respect the dignity of all people. This gospel often gets put on the shelf in many parishes. This is exactly what Pope Francis is trying to get at in his challenge to us to serve people in poverty and in doing so we recognize the living Christ. I am always amazed that in the gospel stories, it was the person who as ill or marginalized who always knew who Jesus was, what he could really do for him or her. If we want to find Jesus in our own lives, then we must hang out with the very people whom Jesus served, touched, listened to, anointed and healed. We must listen to people who have little, because their abundant faith will also set us free. This is what our salvation rests upon, following Christ into the lives of people who really need God. 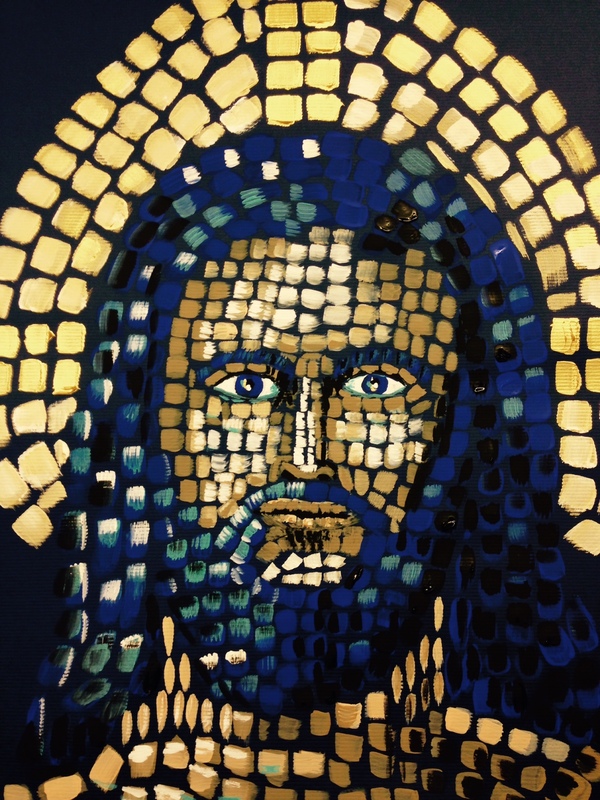 This image of Christ the King that I painted a few weeks ago reflects the dignity of Jesus. I realize it does not view him in the trenches of life, but it reveals a regal dignity, a beauty of Jesus as King of the Universe. The image is not mosaic, but just paint. As I painted this particular piece one Sunday afternoon after Masses, I tried to pray for every member of our parish community and our commitment to live this gospel passage of service to all people. This is the work of the Holy Spirit in our lives.